Proposals to bring the introduction of women bishops closer to reality have been backed by more than two-thirds of the Church of England's ruling body. The General Synod approved the concept of women bishops as "theologically justified" by 288 votes to 119. Archbishop of Canterbury Dr Rowan Williams will address the Synod on Monday to support setting up a legislative group to tackle the issue. A significant number of traditionalists in the Church are against the moves. 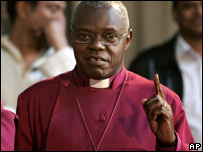 The decision followed a two-and-a-half-hour debate led by Archbishop of York Dr John Sentamu at the University of York. Dr Sentamu called for the Synod to "welcome and affirm" the view of the majority of the House of Bishops that admitting women to the episcopate was consistent with the faith of the church. "I must pay tribute to Anglican women who have been tested for nearly 90 years," he said. "They have kept the faith and remained loyal to the Church of England." The proposed group would draft changes to the Church of England's legal structures to remove the obstacles to the consecration of women as bishops. Reverend Jonathan Baker, from Oxford, speaking against change, said: "We are shifting the ground in things which are very far from incidental to our faith." Supporters of the move argue it is illogical that women can become Church of England priests but not bishops. Christina Rees, chair of the Women and the Church group which campaigns in favour of female bishops, said the Synod's decision was significant. "This is a very strong message that the General Synod is giving, that 'yes, we are now ready, we affirm the ordained ministry of women as deacons, as priests, and now we look forward to having women as bishops too'," she told BBC News 24. The Synod has also been debating whether to allow couples more choice over which parish they get married in. The Dean of Wakefield, George Nairn-Briggs, who supports relaxing the current rules, told BBC News 24: "Since there's been a loosening up of non-religious places where people can get married there have been some very attractive packages put together. "We want to make sure that people realise that the church is very good, actually, at marriage - and in addition they get God."